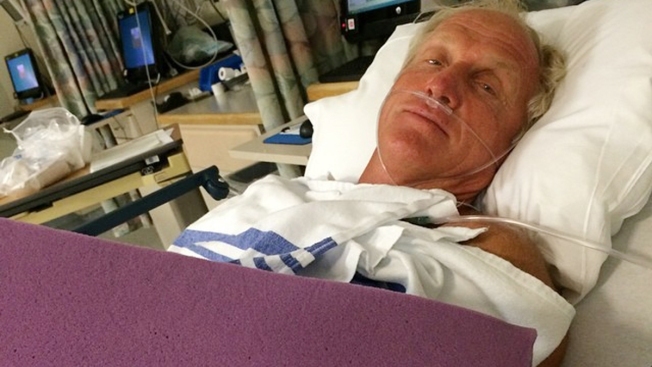 This photo provided by Greg Norman shows Norman resting in a hospital bed after a chainsaw accident. Norman posted a photo to Instagram on Sunday, Sept. 14, 2014, in which he was laying in a hospital bed with his left arm heavily bandaged. The Hall of Fame golfer and entrepreneur, was cutting back trees in his South Florida home when the weight of a branch pulled his left hand toward the chain saw. Greg Norman is recovering from a chain saw accident that nearly cost him his left hand, but not his sense of humor. "At least I can still play tennis," Norman told The Associated Press by phone Sunday morning. Norman, the Hall of Fame golfer and entrepreneur, was cutting back trees in his South Florida home when the weight of a branch pulled his left hand toward the chain saw. He said the blade hit him just below where a person would be wearing a wrist watch. He said doctors told him it missed his artery by a fraction of an inch. "Thank God the blade wasn't running full speed or it would have taken my hand off," Norman said. "I handled everything as calmly as I could. There is no major damage. There is nerve damage, but no muscular damage. They fixed me up and here I am." He posted a photo on Instagram from the hospital bed of his heavily bandaged left hand protected by a large piece of purple foam. "Working with a chainsaw ALWAYS be respectful of the unexpected. I was one lucky man today. Damaged, but not down & out. Still have left hand," he posted. The Shark woke up Sunday to more than 200 comments on Instagram, and news stories from America to Australia. "I just didn't expect when I posted that Instagram that it would explode like that," Norman said. Oddly enough, Norman had posted another Instagram a week earlier standing next to a tree and holding a chain saw. "Time to trim the sea grapes today. Never ask someone to do something that you can do yourself. Love to work!" Norman said he would do it again. "When I'm on a ranch, I love to run the bulldozer, the grader, whatever. I like doing stuff. I never ask anybody to do that for me if I can do it myself," he said. Norman posted another Instagram on Sunday morning, standing in front of the tree without a shirt while giving a thumbs-up with his right hand. His left hand was protected by the purple foam the size of a small waste basket. "Thank u all for your concern & good wishes. All well the morning after the accident. Here I am at the scene of the crime w/ my new fashion statement!" Norman said he would have to keep the foam for at least a few days and would be in a sling for a few weeks before starting rehab. The 59-year-old Australian was inducted into the World Golf Hall of Fame in 2001. He hasn't played competitively in two years. "There's a little tingling in my fingers, which is better than no fingers at all," he said.